Every year my family goes to Milford Lake in Kansas for a few days of playing on the beach, going on boat rides, and really just spending time with each other. As I was preparing for this year’s trip I had to decide what gear to bring, which is always a bit of a tricky proposition because I don’t want to get stuck in the trap of focusing more on my camera stuff than I am on my family, but I also didn’t want to leave anything at home that could be used to get some fun photos. In the end I might have actually gone a bit overboard with gear (isn’t that always the case?) but made sure that I wasn’t getting too distracted with picture-taking during the days we were at the lake. Sometimes I intentionally left my camera at the cabin so I wouldn’t be caught up in taking dozens of photos, and at other times I used my camera only for specific purposes and then put it away when I was done. I also brought out good old-fashioned pocket camera we’ve had for years, because sometimes all you need is something small and portable to capture the memories you want. I’ve discovered over the years that while 50mm is a fantastic focal length in many situations, it’s not my preferred lens when I know I’m mostly going to be with and around family. For that I turn to something wider like my 35mm, and if I know I’m going to be away from the action I also bring along my 70-200. I did bring my 50mm lens on the trip specifically so I could take some photos for my Weekly Fifty blog, and it stayed on a shelf the entire time except for when I specifically went out with my brother Andy to capture some shots of lightning as a storm rolled through the area. At first I ran down to the beach near our cabins but soon realized that the surrounding trees and camping areas were obscuring most of the incoming clouds. 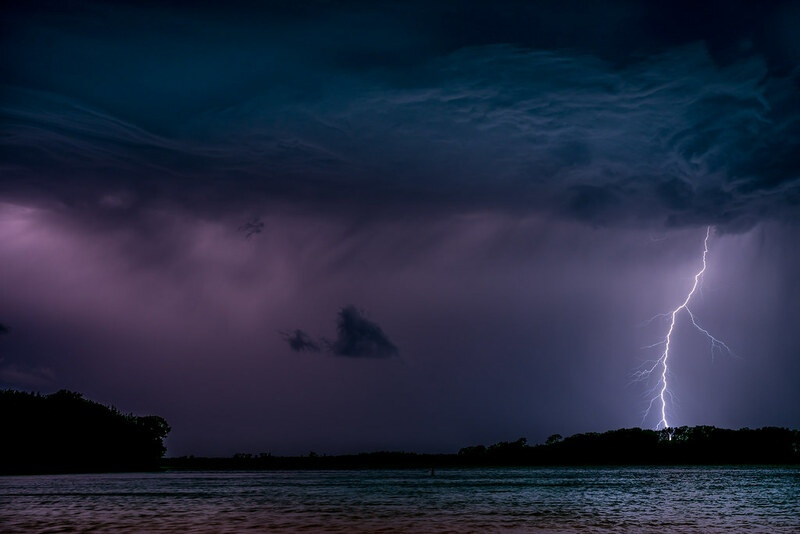 When that wasn’t working out I went back to the cabin, found my big brother, and asked if he wanted to drive down to the boat launch and set up shop there to catch some lightning shots. He grabbed his camera gear and off we went, hoping to do the best with what we had. Andy was better prepared than I, having a nice tripod and a remote shutter release whereas I had to borrow my dad’s tripod and use a 30-second timer. This gave Andy the ability to shoot in Bulb mode (basically opening the shutter for as long as he wanted to, and then clicking his remote shutter release again to close it) whereas my 30-second exposures had to be done over and over manually. It wasn’t a big problem though, and every time my 30 seconds was up I just clicked the shutter button again and sat there waiting. In fact, it was the waiting and uncertainty which were the most difficult parts of getting this shot. We had no idea where the lightning would come from, where it would strike, or how much time we even had to work with before the rain started falling. Because of this a wider lens would have been good since it would have allowed more room for error, but I stuck with my Nifty Fifty just because I wanted to see what would happen. Turns out I got a shot that I really like, and I can honestly say it’s the best lightning picture I’ve ever taken. It did require some postprocessing (yay for shooting in RAW!) but after I brought out some of the colors in the clouds and in the background I was even more pleased with how the image turned out. The one thing I don’t quite understand is why the trees on the lower-left corner have a bit of a white halo around them. It’s not anything I did in Photoshop, and if you look closely the trees on the lower-right have a similar type of glow. I did raise the shadows quite a bit in order to bring out some color in the sky, but I don’t think that was causing the halo effect. Rather I’m guessing it was the flash of light from the lightning bolt that provided some backlighting to the trees. Whatever caused it, I don’t really mind it except that it tends to look like a poor job of photoshopping which, I can fairly confidently say, is not the case. Great article. I have not had any personal experience w/ this type of work since living in this part of Ohio, we do not have any severe lightning . I certainly will try next time if opportunity arises. One point I wish to make is that the same tricks of trade can be applied towards Fireworks photography, which is omnipresent. Super shot! Thanks for sharing the process of getting it. I love this image, I’m just not a fan of storms…but that’s a story for another time. On our last vacation I took only my 24-70 f2.8. It is a fantastic all-around lens and a great performer in low light. Had our vacation included nature & wildlife photo opportunities, I probably would have packed my 18-400 lens as well. Like you, the balance between hobby and family must be respected. How do you like that 27-70 2.8? I’ve been thinking about getting one. Right now I have a 35 1.8 and 50 1.8 and 85 1.8, and having a single lens to cover basically the same focal lengths (albeit with a somewhat smaller aperture) would be nice. Great shot, Simon. I love the colors and of course the lightning is well to me a little frightening. But here in the state we both reside it happens fairly frequently so I should get over it. You know in all the years I have done photography the one thing that intimidates me is Bulb mode. I need a tutorial written by someone that writes well (hint, hint). Might we see one on DPS soon? Great photograph! Love the lighting(and the lightning)…the water in the foreground, the clouds….and the composition! Well done. When I saw the title prior to opening the email, I thought perhaps you got a shot of your kids running toward you at full speed…..Charge! Hahahaha! That would be a fun photo to take, Joel :) I appreciate your comments on the lightning shot and I’m glad you liked it!